Motto: Live Rogue; It's the Climate! The Oregon-Utah Sugar Company (financed by Charles W. Nibley) was created, leading to a sugar beet factory being built in Grants Pass in 1916. Before the factory opened, Oregon-Utah Sugar was merged into the Utah-Idaho Sugar Company. 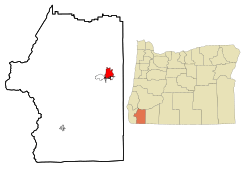 Due to labor shortages and low acreage planted in sugar beets, the processing machinery was moved to Toppenish, Washington in 1918 or 1919. 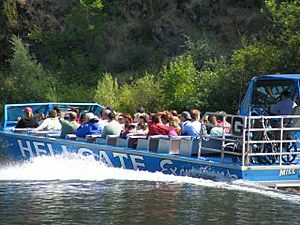 Grants Pass is located in the Rogue Valley; the Rogue River runs through the city. U.S. Route 199 passes through the city, and joins Interstate 5. According to the United States Census Bureau, the city has a total area of 11.03 square miles (28.57 km2), of which, 10.87 square miles (28.15 km2) is land and 0.16 square miles (0.41 km2) is water. 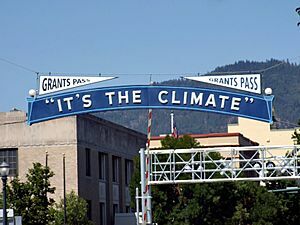 True to its motto, “It’s the climate!”, Grants Pass has a Zone 7 climate. According to the Köppen climate classification system, Grants Pass has a hot-summer Mediterranean climate (Csa). Summer days are sunny, dry and hot but it cools down dramatically at night; the average August high temperature is 88.8 °F or 31.6 °C but the low is only 53.7 °F or 12.1 °C. Winters are cool and fairly rainy with only occasional snow; the average January high temperature is 46.6 °F or 8.1 °C and the low, 35.1 °F or 1.7 °C. Grants Pass receives roughly 31 inches or 790 millimetres precipitation per year, with three-quarters of it occurring between November 1 and March 31. The mild winters and dry summers support a native vegetation structure quite different from the rest of Oregon, dominated by madrone, deciduous and evergreen oak, manzanita, pine, bush chinquapin, and other species that are far less abundant further north. The record high temperature of 114 °F or 45.6 °C was on July 23, 1928. The record low temperature of −1 °F (−18.3 °C) was on December 9, 1972 until 1990 when it reached −3 °F (−19.4 °C). There are an average of 51.3 afternoons annually with highs of 90 °F or 32.2 °C or higher, eight afternoons reaching at least 100 °F or 37.8 °C and 77.5 mornings annually with lows of 32 °F or 0 °C or lower. Measurable precipitation falls on an average of 110 days annually. 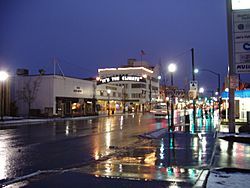 The wettest “rain year” was from July 1955 to June 1956 with 50.69 inches (1,287.5 mm) of precipitation, and the driest from July 1923 to June 1924 with 13.43 inches (341.1 mm). The most precipitation in one month was 20.63 inches (524.0 mm) in December 1996, and the most precipitation in one day 5.27 inches (133.9 mm) on October 29, 1950 – this was part of a two-day fall of 9.38 inches (238.3 mm) and ended a five-day fall of 11.26 inches or 286.0 millimetres. There is an average of only 4.6 inches or 0.12 metres of snow annually. The most snowfall in one month was 34.1 inches (0.87 m) in February 1917. As of the census of 2010, there were 34,533 people, 14,313 households, and 8,700 families residing in the city. The population density was 3,176.9 inhabitants per square mile (1,226.6/km2). There were 15,561 housing units at an average density of 1,431.6 per square mile (552.7/km2). The racial makeup of the city was 90.9% White, 0.5% African American, 1.2% Native American, 1.1% Asian, 0.3% Pacific Islander, 2.3% from other races, and 3.7% from two or more races. Hispanic or Latino of any race were 8.5% of the population. There were 14,313 households of which 30.7% had children under the age of 18 living with them, 41.3% were married couples living together, 14.5% had a female householder with no husband present, 4.9% had a male householder with no wife present, and 39.2% were non-families. 32.8% of all households were made up of individuals and 16.3% had someone living alone who was 65 years of age or older. The average household size was 2.34 and the average family size was 2.94. The median age in the city was 39.3 years. 24.3% of residents were under the age of 18; 8.4% were between the ages of 18 and 24; 23.6% were from 25 to 44; 25% were from 45 to 64; and 18.6% were 65 years of age or older. The gender makeup of the city was 47.3% male and 52.7% female. As of the census of 2000, there were 23,003 people, 9,376 households, and 5,925 families residing in the city. The population density was 3,033 per square mile (7,855/km2). There were 9,885 housing units at an average density of 1,303.3 per square mile (503.5/km²). By 2008, the city's population had increased to 33,239. According to U.S. Census figures from the 2006-2008 American Community Survey, the racial composition of the city's population was 93.6% white, 0.2% black, 1.6% American Indian, 1.1% Asian, 1.2% other race, and 2.3% two or more races. Hispanics or Latinos, who may be of any race, formed 7.2% of the city's population. There were 9,376 households out of which 31.1% had children under the age of 18 living with them, 44.5% were married couples living together, 14.5% had a female householder with no husband present, and 36.8% were non-families. 31.2% of all households were made up of individuals and 16.0% had someone living alone who was 65 years of age or older. The average household size was 2.36 and the average family size was 2.94. In the city, the population was spread out with 26.0% under the age of 18, 8.1% from 18 to 24, 25.7% from 25 to 44, 20.7% from 45 to 64, and 19.4% who were 65 years of age or older. The median age was 38 years. For every 100 females there were 86.8 males. For every 100 females age 18 and over, there were 80.7 males. The median income for a household in the city was $29,197, and the median income for a family was $36,284. Males had a median income of $31,128 versus $23,579 for females. The per capita income for the city was $16,234. About 12.2% of families and 34.9% of the population were below the poverty line, including 20.8% of those under age 18 and 7.3% of those age 65 or over. Boatnik, a speedboat race and carnival event, is held every Memorial Day weekend in Riverside Park. The historic Rogue Theatre downtown has been transformed into a performing arts venue that hosts mostly local acts. The Grants Pass Towne Center Association's "Back to the '50s" Celebration includes free concerts, a nearly 600-vehicle Classic Car Cruise, Poker Runs, and thematic shopping in the town's downtown historic district. Year round, there are First Friday Art Nights. On the first Friday of every month, many of the city's downtown stores hold art shows and promotional events. The Grants Pass post office contains two tempera murals done through the U.S. Treasury Department Section on Fine Arts (often mistakenly referred to as the "WPA"), both painted in 1938. There are ten government-sponsored New Deal era murals in Oregon; Grants Pass is the only post office that contains two. The murals are "Rogue River Indians" by Louis DeMott Bunce (who also did a 1959 mural at Portland International Airport) and "Early and Contemporary Industries" by Eric Lamade. Grants Pass has numerous and diverse parks and green spaces. Notable city-run parks include Riverside Park, summer home to the local Concerts in the Park series, and the Reinhart Volunteer Park, a park largely built through the efforts of community volunteers and featuring facilities for many sports. 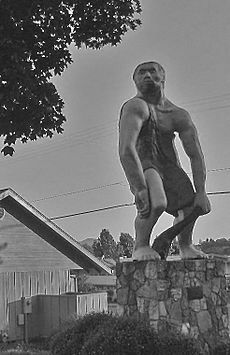 Grants Pass, Oregon Facts for Kids. Kiddle Encyclopedia.